I have been recently working quite a lot in Visual Studio Code (VSC), writing some Go code. With the Go for Visual Studio Code extension – writing code is easy and simple experience. For .Net however, I was using full version of Visual Studio. There were several reasons for that. Initially, VSC was designed to build ASP.Net code and I rarely do web applications only. Technically speaking, one could have used command line tools like msbuild or csc for building other types of .Net components, but the experience wasn’t acceptable. Especially, if you’d try to use NuGet packages in your code. Recently I thought, why not to give another try, because new tools for .Net development were added to the VSC. Alone this code wouldn’t be a problem, if not the fact that it is called like 1,000,000 times per second. It is a problem that has been discussed on Stackoverflow and these days it is easy to find the code behind Enum.ToString() on github. As a result, single-liner ToString() can result in a measurable performance hit under heavy workload. Could I write benchmark for this case in VSC now? The problem is obvious and solution is clear, the question for me was whether it is reasonably possible to write .Net code that would benchmark that scenario using Visual Studio Code. On the machine I had only VSC installed, nothing else. Opened VSC and, just after creating first file with extension .cs I was greeted with the message suggesting to install recommended extensions. 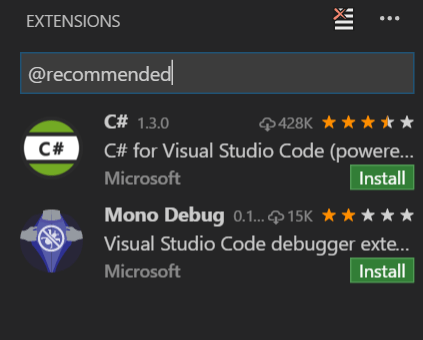 Nice surprise after choosing “Show recommendations” was the list of two extensions: C# and Mono Debug. I have decided to go with C# extension only. This resulted in yet another prompt that I need to install .Net CLI tools. Note: I don’t have full version of Visual Studio installed on this particular machine, so I needed to download .NET Core SDK for Windows. I did installed that (restart of the machine was required) and went back to VSC and Command Line. Guess what type of application I got by default? Console application! Back to the command line roots. – builds and runs the code. It was easy to figure out that you need to type the NuGet package name in dependencies section. Another nice part, that Intellisense was suggesting package versions. It was slightly harder regarding framework version, because, at least on my machine, I cannot have both net461 and coreclr configured at the same time even without diagnostics module. Note: I needed developer pack: https://www.microsoft.com/en-us/download/details.aspx?id=49978 to be installed on my machine. The code was still building, so I needed to attach the benchmark to the existing code and see for the results. There’s still some mess, especially in the area of handling different frameworks and runtimes, however the state looks much better now than even a half a year ago. I definitely could start building some server-side .Net apps using Visual Studio Code and I like that. Also, we already know that project.json is almost gone before even making full appearance. That means, inevitable changes, issues and status “not yet there”.